Vijay loves all things plantain; so much so, he even wrote a guest post on homemade plantain chips on my blog few months ago. When I saw the recipe for sweet plantain dessert, at LG’s Ginger and Mango, I knew Vijay is going to like it. Dessert with sweet plantains usually involves deep-frying, but this traditional Kerala recipe was different and healthy because it was steam cooked. I tried it with one ripe plantain and we both liked the end result. Easy dessert and they were like small venna(butter) biscuits, the kind that would melt in mouth but with gooey, banana sweetness. Ghee and sugar - half tablespoon each or to taste. Wash and cut plantains into 4 or 5 pieces crosswise. Steam-cook them for about 15 to 20 minutes, until they soften. The outer skin will turn black and insides will turn soft. Remove the steam basket from steamer and let them cool. Peel the skin, cut each piece into 3 or 4 thin rounds. Take melted ghee and sugar in a small cup. Stir until sugar melts in ghee. Lightly dip each plantain round in ghee-sugar mix, remove. Or sprinkle some sugar on top of these rounds and serve. Good treat, I think particularly for toddlers. Did you see Stephen Colbert on C-span’s televised Correspondents’ Dinner, last Sunday night? His comedy skit was breathtaking in its boldness. Charming, clear and ironically straightforward - his comic delivery was a sight to behold. Finally it took a pretend journalist to state the obvious - the little emperor has no clothes and of course that made the ‘real’ journalists and the guest of honor spitting mad. If you enjoy political satire or like Colbert style, don’t miss out his stellar performance and checkout this site for transcript and video link. One has to admire his chutzpah. Coming back to cooking, here is a traditional recipe where plantain and moong beans are cooked together in water and seasoned with green chilli-coconut paste. Rural in origin and often served with sorghum roti, this favorite curry of mine is a hearty, flavorful and filling meal, also one of the ways that I cook plantains aka green bananas. Take the presoaked whole moong beans, about 2 cups in a big vessel. Add 4 cups of water, quarter teaspoon of salt and cook them covered on medium-high heat for about 15 minutes undisturbed. Presoaked moong beans cook easily and can be done without using the pressure-cooker. It tastes somuch better cooked in this old style. Meanwhile do the prep work. Peel and cut plantain and make a smooth paste of green chillies-coconut. After 15 minutes of cooking, check the moong beans. They must be tender by now. Add plantain cubes, turmeric and also water if needed. Cover and cook them on medium heat again for another 10 minutes. Plantains cook fast unlike potatoes and by the end 10 to 15 minutes of cooking, plantain cubes will be tender and the moong beans will be falling apart. That’s what we want. At this stage, stir in green chilli-coconut paste and cook for another 5 minutes. Just before turning off the heat, heat a teaspoon of peanut oil in small vessel, add and toast the popu or tadka ingredients. Add this to the curry and stir. Turn off the heat. Serve and enjoy the best tasting curry, the kind you’d find in a humble Indian home (never in a restaurant). Usually served with chapati, sorghum roti or with rice. Prepare the curry little bit on the watery side. The gravy of this curry comes from watery, overcooked moong beans and the greenchilli-coconut paste. I’ve also added one banana pepper to this curry. “Okay, it’s my turn now”, I said. “What is your turn for?” she said with a curious look on her face. “I want to make chips with the plantains we bought yesterday. You just relax and wait for a tasty snack I’m going to make for you”. I said to her. But it wasn’t just for her. It was for me too. I like plantain chips very much. But, I don’t get very good quality chips here. So, whenever I could find good quality plantains, I prepare the chips myself. Making of plantain chips in-house started few years ago, when we were in Houston. We have a good friend, Sunil Sukumaran, who is a Keralite. I knew that plantain chips were popular snack food in Kerala and I always wondered how they were made. I thought that there would be some special process to make them, because they were different, tasted good and had a special flavor. During one of our visits to their house, I asked my friend Sunil. “Sunil, do you know how these plantain chips are made? I like them a lot, they are really tasty.” I expected a very long answer. I will tell you the truth. I was getting ready to note down the details on a sheet of paper. But his answer surprised me. Just one sentence! “That’s all? !” I didn’t believe it. You don’t know how much relieved I was. Oh, I can make my favorite snack food right in my home. That’s fantastic. Houston is a very lively city with all kinds of people from all over the world. Also a great place to get all kinds of food and vegetables. Most importantly (for me), I could get four fresh plantains for a dollar! How nice! Bought four of them and brought them home. Washed them thoroughly and scraped the outer skin lightly. I didn’t remove the skin completely. Cut them into circular chips. In the meantime, I had a big cast iron frying pan with peanut oil heating on the stove. When the oil reached proper temperature for frying, I dropped the chips in oil. One after the other, I filled the pan until the whole oil surface was covered by the chips. Reduced the heat to medium-high, and fried them for about three or four minutes. I turned the chips in the pan occasionally to make sure that both sides are properly fried. I was very happy. Why? I just made the first batch of plantain chips myself. They looked just like the chips I was used to buy in Kerala bakeries. I sprinkled little bit of salt and they were ready to eat. I thanked my friend in my heart for sharing the great secret with me. Now, coming back to Boardman, Ohio, there I was making the chips again, for Indira (and myself too). A full bowl of chips were ready in just few minutes and they also disappeared in just few minutes. But, I was quick enough to take some pictures to share with you. Here they are, tasty and crunchy, homemade plantain chips. 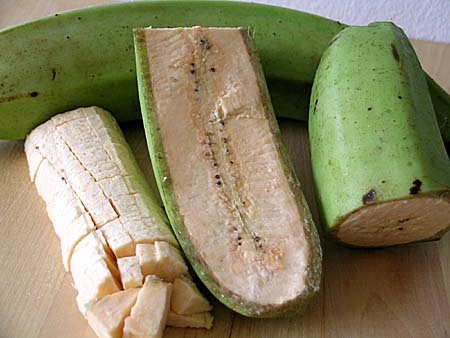 Unripe plantain, the vegetable that belongs to banana family is a acquired taste. Like potato, plaintain cubes fried or boiled to soft taste super good. Why not, plantain is nothing but pure startch. There are several different versions of curries with plantain, as it is quite popular vegetable, particularly in South India. This curry with fresh coconut and chana dal is one of them. First soak chana dal in water for about 30 mts. Meanwhile make a paste of fresh coconut and green chillies by adding a pinch of salt. Place of a pot of water on stovetop on medium heat, wait for it to boil. Meanwhile prepare the plantains (wash, pee l& cut). When water starts to boil, add these cut plantain cubes to water. Cook them for about 5 minutes on high heat, then pour them into a colander and discard the water. Now in a big sautepan, add one tablespoon of oil, do the popu i.e (fry one tsp of mustard seeds, cumin and curry leaves), then add the soaked chana dal. Fry them in oil for few minutes. Now add the plantain cubes, turmeric, salt, coconut-greenchilli paste. Mix them thoroughly and cook them covered for about 10 to 15 minutes. This curry tastes great with rice and Sambhar or dal. But today I prepared chapatis instead of rice. So here it is plantain curry chapatis.